I want to first mention that these (Lay-N-Go Lite & Large) are mainly for Lego’s. They are perfectly made for easy clean up of Lego’s. But, if you’re like me and have a daughter (or more) then you can use these for her small toys; such as Polly Pockets, Squinkie’s, Little’s Pet Shop, etc. You can put anything that will fit in the bag. There are many color options for the bags as well. One feature that really stuck out to me was how the bags completely fold out which makes cleaning up VERY easy. The fact that they had pink really had me going too! I also LOVE the Gold color Cosmo bag, I couldn’t of asked for a better surprise from the company! Once you’re done playing, clean up is like 1,2,3. 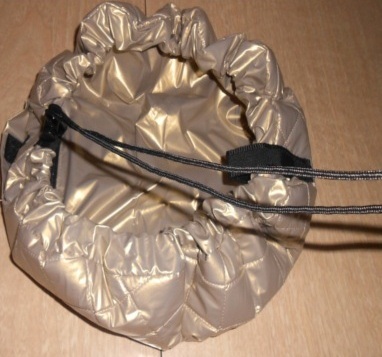 Put all the stuff into the center of the bag and pull the drawstring provided, until it completely closes up! The Lay-N-Go Lite is very easy for “small play solutions”, meaning it is best for traveling or going places. I took it today to a meeting it was easy and light weight I was able to put my keys, phone, and my daughters toys in it as well. If you are on the go a lot, this is what your kids will want! I’m sure all you ladies know what the Cosmo bag is about…you’re right, make-up! I love this make up bag! Lately my daughter has been getting into my make-up bag. She loves to play with it. 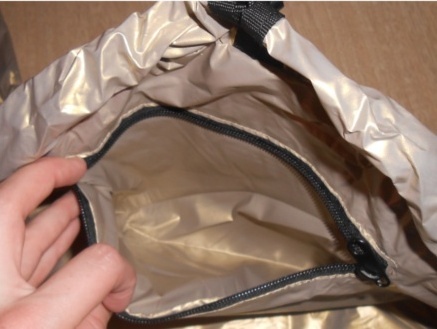 I hated having to zip my previous make up bag up. (Lazy I know!) But with the Lay-N-Go, I can easily pull it up with the draw string. The Cosmo Bag also has a zipper pocket for more important things. I put q-tips and my contact case in the zipper pocket! All the bags are machine washable. Which completely rocks for the Cosmo bag! They do have one more Lay-N-Go that I haven’t mentioned. This one is SEEMINGLY perfect for huge Lego loads! 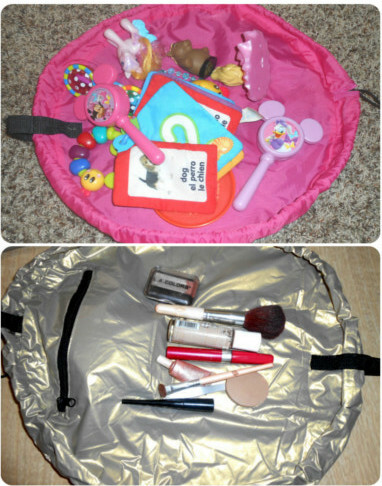 The Lay-N-Go is a great and easy way to store my daughters small toys and the cosmo bag makes my make-up life so much easier! I would recommend this to anyone. 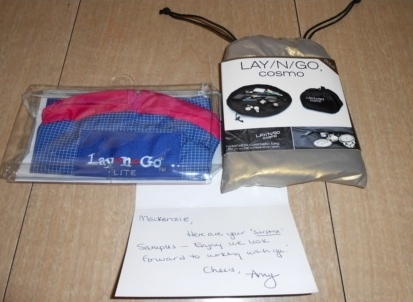 Lay-N-Go has been ever so kind to give us not one, but (2) winners of the Lay-N-Go Lite! Open to USA, No Purchase necessary. Contest ends on July 20, 2013 at 11:59 pm EST. This promotion is in no way sponsored, endorsed or administered by, or associated with, Facebook. The winner(s) will be selected by random.org and notified by email and will have 24 hours to respond back to original email with their shipping info or a new winner is selected. Good Luck! I love it! The bag looks very unique and is exactly what we are searching for! I like the Lay-n-Go LITE in Red. Looks so handy for many things. I would buy the lay-n-go lite in lime green…that is awesome!! lay n go lite in green. I think they are really cool & a great idea. I would pick the Lay-n-Go LITE Green. These are awesome!! My girls favorite color is green and holy polly pockets and pink legos!! This would be great to win since my LO has a ton of little toys that are scattered everywhere. (20IN. DIAMETER) for a cosmetic bag. I think this would be ideal for my kids little things! I would choose the lite in blue! I would LOVE this for my granddaughters toys when they visit. I like the Lay-N-Go LITE in blue (my favorite color). these are so cool! i would love one for all the kiddos toys. would be great for grandma’s house too! i love the pink one! I like the Lay-n-Go COSMO Black. I really like the Lay n Go Large in Green! It would be perfect for carrying Holiday & Birthday gifts! I like the red Lay N go Lite. And the gold Cosmo. 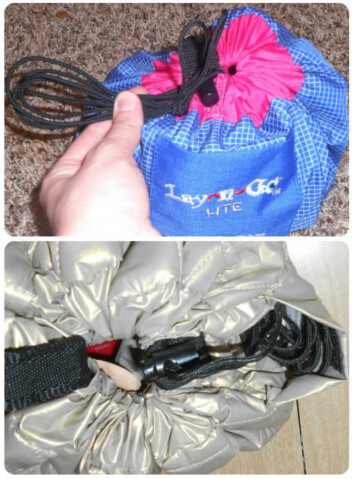 I like the black or blue Lay-N-Gos because I would use them for my boys million of legos! I’d love the red one! This would be perfect for all those little pieces that always come with dd’s Monster High and Princess dolls! I like the pin one because I have 2 daughters and I like that it can carry small items! I like the Lay-n-Go LARGE Green. That’s tough because both are needed in my house, but I would pick the lay-n-go lite in pink. I’d need the large one for sure!!!!!!! Wow! I’d like to have 3 or 4 of these. I’d give them to my grandsons for their Legos and miscellaneous other toys. My daughter-in-law and daughter would love them. I’m not completely altruistic though, I’d like a Cosmo in Hot Pink for myself. It would make packing for the gym and vacation a breeze. I would want the blue one for my son. I need something like this My son’s stuff is all over the place. Such a cool idea…I am always packing a little bag of toys for the girls but then you have to take them out to play and put them back in…this is such a time saver all in one idea…I would pick the Hot Pink 20in one from their website! So cool! I can see using these in a classroom for centers also. It would make my life so much easier! Think it is a great idea! Would love to give as a gift to my nephews. Love it, this is too neat! Lime green! I would love this. I have a 1 1/2 year old and it would be great to entertain him while waiting at restaurant or even just while visiting. I want it in Green! I’d get the cosmo lime green cause it’s my favorite color. These things look awesome…would love to have one. this is so cool especially for those teenie tiny toys like squinkies! I would get pink. so pretty. OMG!!! Maybe, just maybe, our 1 yr old can we kept away from our 4yo’s squinkies and/or Playmobile parts!!!!! This looks so easy to use at home or away. Thanks for telling us about them. I would LOVE to get one to try and would prob end up buying several more if it works. I love the Lay-n-Go LARGE Blue. Perfect for all those legos my son has! I would love to get the COSMO Silver Make-up Lay-n-Go! This is a brilliant idea!! I would choose the LAY-N-GO LARGE GREEN 5 f diameter. I would get the pink and blue one. I have 3 kids and lots of toys, esp Legos! This will be a great help. Thankyou! This would be awesome, I have a 5 year old wish I had seen this years ago! It is an awesome idea and clean and safe! I would get my son a green one to carry all of his tiny toys in! I love this! I like the lay n go Large! The blue! I want to win this so bad! I want the large green lay n go!!! This would come in sooo handy! My kids have Lego spread out everywhere! This is a fabulous product! We would love to have a blue one!!! I would love to have one. That would be great for hot wheels, and lego’s. I just love the large one! Would love to have it in Pink! 🙁 Would be great for the new baby coming to lay on. I’d get the Lay-n-Go COSMO Hot Pink. I have never seen one of these, but I love the idea! And all of the colors are cool so it does not matter to me what color I would receive! I’d love the large blue one! I think I would like to have the biggest one possible! That way it would be the most versatile. Silver would make the toys stand out a little better. I like the Lay N Go Cosmo in gold! Clean up would be so much faster! This would be great for our third child due in December! Have playtime at Nana’s house and easy clean-up! Something to keep by the door for last minute trips there, or anywhere! I’d love to use this for our homeschool trips to the library as well! I would love this! I may end up buying some lego if clean up is this easy! I love this idea! Lagos have taken over my daughters world and the pink largest one would be awesome!! Oh my… I have 3 grandkids that carry stuff everywhere we go! This would be awesome! The biggest one – whatever Color! I love that large one in any color. I would so use it like they do in the picture for my little ones Legos. This awesome! Would love to win! That looks really cool ! I would love to be able to travel with toys for my kiddos . I would order a green one since I have a boy and a girl . I’ve wanted something like this forever! It seems like the perfect solution for makeup/cosmetics. I like the Lay-n-Go LITE in green. I think this is the perfect solution for my kids’ messes! Not just making it easier to clean up, but easier to keep their toys in 1 place — we have tile floors and tiny pieces and part with wheels slide away from their playing. Perfect solution! I like this bag!I have a lot of Lego’s laying around.I would pick the Lay-n-Go LITE Green. I like the silver or the blue in the giant size!!! I would like the green one! I would give it to my friend whose grandson has lego! I like the Lay-n-Go LITE Blue. These are cool…i’ve never seen or heard of them before…..I must have!!!! Thanks for the chance to win! Love them. Looks like a great way to declutter and keep like toys / items together. Wouldn’t it be great for legos or blocks? or polly pocket or barbie bits and pieces??!? Omg how have I not seen the lay n go before. I so need one!!! This looks awesome! My daughter loves small toys like Polly Pockets and this would be awesome to have! I would like the lime green, would be great for any of my grands. What a smart idea. I love that black one and the lime green one. i’d love the lite blue! Great for the grand kids. I would buy LITES in every color they had. I have four kids, so I would need one for each of their specific things since they HATE putting the cars, blocks, play food, musical toys etc back into their shoebox size totes! This is a great giveaway! I have never seen anything like this! Thanks for this opportunity! Love it… Tired of stepping on Legos! I love the Lay n go lite Green, This is just what I need . I have 3 kids, ages 7,5, and 22 months and they all have small toys that this would be perfect for ! I think I’d get black. so handy… toys sure….. and I never considered makeup!! I think it is cute, and i do love that pink. I love the small one to take with you anywhere………..with 4 kids the LAY~N~GO LIGHT all the way!!! I like the Lay-n-Go Blue in the 5ft size. My grandchildren love their Lego’s and this would come in handy for me. I wouldn’t have to pick every piece up I could do it all at once with Lay-n-go. I think this is a great idea for a product. My son will be getting into legos soon so this would be great to have around waiting for its chance to be useful. Great giveaway ! Love the large Lay n Go but now thinking about all the different uses for the small black one. I like the large one and think it would be great for grandson’s legos!! OMGosh, this would be PERFECT for all the little toys my grandgirls spread out everywhere. This is a GREAT product!! any color and i would use it for my sons legos and little hotwheels cars that end up all over the house. This looks like a great idea. I have 12 grandchildren, so this will certainly come in handy when they visit. These are so cute & an awesome idea! Just saw the link on facebook! I think this is an awesome products and would love to win a blue one!!!! Would be great when we are out and need to take toys with us. I would love the green!!! Awesome product! I would choose the lime green. This is awesome! We are TTC and this would be amazing to have. I’ve got friends who could use this, too! I like the Lay-n-Go Lite in Blue. I have had my eye on these for a while. Just saw the give away!! Lay-n-Go in LARGE in the color PINK. I would choose the Lay-n-go in blue. I would get a red lite. Perfect for Squinkies! I’d get pink! I would love to have one of these, esp. the large one. I have four young granddaughters who play with Legos, polly pockets, Littlest Pet Shops and this would be perfect to clean up things fast. I would use them for all my grandson’s legos & action figures in Blue of course..but color wouldn’t really matter but the ease of use would…!!! my grandson loves legos but doesn’t like picking them up- this would be awesome to keep them all in one spot.. he loves the lime green one… thanks for this awesome giveaway! This would be awesome for my house. My sons Legos, my daughter art supplies, all packed up for the car or Nana’s house! Would love to win the large lego bag. Would be good for more than toys. Would love!! My sons Cars, Toy Story and Monsters Inc toys have taken over our house! This is a great idea, I would like one for Legos. I am unable to walk in my sons room right now because of them. Like the green! Blue would be awesome! My daughter LOVES blue! I can think of a lot of uses for these Lay N Go’s. I really like the idea for the baby toys, stash car trip toys in it or sandcastle tools for a trip to the beach …..
love the hot pink one.. Ocean Blue would be great for those kids things. I love the idea of this, a great thing to have with kids that drag toys out and don’t want to put them up. I would like the ocean blue. I would love for my two kids to have one of these for their Legos! I would pick the blue small Lay-n-go. My son has a lot of cars he likes to play with. The lay and go would make it so much easier to transport toys from place to place. I think the Lay-n-Go Lite in red would be awesome . I love the Lay-N-Go large in blue or green. It would be great to take to the baseball and soccer games for my children. I also like the smaller ones. It would be nice about putting crayons/markers in for car rides. What a great item. Would love to have one of these. What a cool idea! I hope I win one of these. I think my 7 yr old daughter would love it for her little polly pockets and my little ponies! I think this product is great! It would be perfect for my daughters littlest pet shop stuff. That stuff is everywhere!! Love this idea especially for someone who travels. I love the lay and go lite! This is such a great idea! I need one for each of my kids! I like the LAY-N-GO LITE GREEN! What a great idea, my grandsons have so many building sets with little parts and this would be perfect. I have a 7 year old and a 2 year old, and they can spread out some toys! This would be great to have for them to contain their ‘mess’! Perfect for Lego and other little toys. I like the green one. This looks like an awesome product! So convenient – I’d love to win one! Great item and giveaway, never have seen this, would help me alot on my pain days! I would love to have this for my granddaughter …..would help make her toy clean up so quick. Awesome! Looks like it would make clean-up of small toys alot easier. It’s an interesting product. I’m not sure I love it (I like it) but I’m pretty sure my Lego maniac son would LOVE this to the moon and back! I love this idea and would love to win for my husbands toys. this is brilliant!! I love the small gold one! My two year old would be in his glory with one of these. Very good idea. I love this idea, and with 3 little kids on the go all the time, this would be very convenient! My fav color would have to be the Lay-n-Go COSMO Hot Pink! I love the lay n go large green! Could so use one of these, not picky about color. I think these are great and wish they would make one big enough for Barbie’s!! Haha. My youngest has all the Disney figurines and this would be perfect! I would get the Lay N Go Large Blue the 5 feet would great for my sons cars and legos!! This thing looks amazing!!! I so need it with is 5 tubs of cars, this would make life easier!!! Very clever! I would love to have. It would make cleaning up toys 1,000 times a day so much easier! This is a great idea! I would love the cosmetic bag one because I travel a lot for work and this would be awesome! These are easy storage solutions and would work great for my daughter’s toys to go in the car or just organize. I’m thinking the larger one would be perfect for all my son’s Hot Wheels cars. I find those things everywhere & they’re a pain to pick up & travel with. I think this is an awesome idea. It honestly falls under the “why didn’t I think of it”! 😀 I would have loved this for my older kids and would love to win it for my youngest. This would save so much pick-up time! I love the Lay-n-Go Lite in red or lime green. Love these with four kids I have always thought they were great. I would love for the girls to be able to use them for all those tiny toys they have. My girls little stuff would be great in these. Yay. I really like the Lay-n-Go Lite in Green! This would be great for when my little guy wants to take his Little People to Mommoms house to play. Looks like it would make clean-up SO MUCH easier! It will definitely come in handy when he discovers Legos! Lay-n-Go COSMO Black is what I would get! Would love this, easy clean up! This would be fantastic, I’m forever stepping on Legos! These would be perfect for the boys to haul around their toys. Love the look of them (they’re so functional) and I adore the lime green! I think this would be a fantastic thing to have for trips to grandmas! I’d like the blue one! I like the lay n go in large green it’s a great way to pick up a play area fast. Great idea. Love the blue and green design. I am just now seeing this giveaway but i love the idea of this product. I am sure i will still find use for it but boy would it have been useful these last 11 years with my little brood. Wonderful bag, would love the blue. The blue lite lay n go! I’d get the lay n go in lite in green/blue for my son, and the lay n go cosmo in silver or hot pink for myself! I would choose the Lay-n-Go in Lite Blue or the Ocean Blue! I would love to get the Lay-N-Go Large in Green! lay and go large blue. I would love the LAY-N-GO COSMO HOT PINK! I think these are great and easy to use for young and old.I would go with the Lay-n-Go LITE Red. I love the bag. It looks so easy to have everything picked up in one place really quick. so convenient for my lil ones…..would like the lay-n-go in large green. I would get the Lay-n-Go LITE Pink. This would make clean up so much easier and it would be helpful when traveling. I would love to get the Large one…I have 2 boys and a tom boy so lots of various sized legos and various other similar toys…the large would hold so much of the toys and free up a ton of space in their shared room 🙂 thanks for the chance to win! I really like how easy it is to pick up small pieces all at once and store them. I think I would get the large blue lay n go for my nephew’s legos. However, I really would like a blue cosmo lay n go for my beadwork projects. I think it would make an excellent beadwork surface and would keep all of the seed beads I use in one place. I love the idea of the cosmo bags and I personally think the lite bags would be great for trips to grandparents houses! This looks like a very interesting bag! and something that would be very handy. I love the large one, but wish it came in fun girl colors, too. I have a lite and it is awesome! Sooooo many uses! Thats really cool. I iwsh i came up with it. Very close. 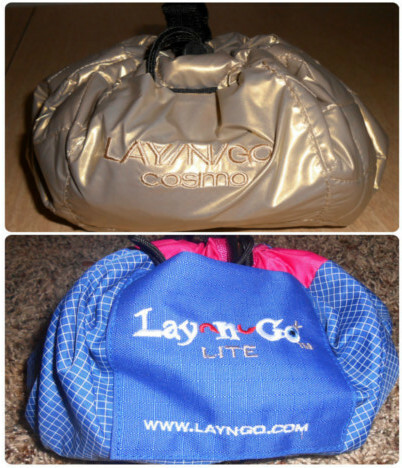 Lay-N-Go Lite or regular size in blue. Blue large….2 grandsons would work wonderfully. toys! This would be awesome! Love these and would love to win for the grandbaby! I would choose the Lay-N-Go lite in blue. It’s my little mans favorite color and I would use it for his trains that have to go everywhere with us lol. Thanks for the wonderful giveaway. This would be so nice because I have Grandkids lots of times and I wouldn’t have to waste time cleaning up a mess. These are awesome. I want one in each size. I love this idea. would love it for my Grandsons. Your review is great. Cool idea. I like the Lay-n-Go COSMO Black. Thanks for doing the giveaway. What a great idea! I really like the cosmo in Gold. Would be perfect for our hair accessories!! (20IN. DIAMETER) is the one I would pick. FABULOUS!!!! Would definitely love this! Cool idea. Thanks for the giveaway opportunity. As a teacher, I spend the bulk of my summer working in my classroom on redecorating the room or reviewing past lessons. Frequently, my three-year-old tags along. I’ve been looking for something that would make taking him with me easier. This bag would be perfect for him. He could use one bag to carry his toys and as a play mat to keep him off the cold, hard tile floor. This would definitely save me some pack mule time…I usually carry a bag of toys and a bag of other things (like a blanket) for him to use while he’s there. I’m all for anything that makes life easier or at least less difficult for traveling. Looks awesome. Would love it for my Grandson! I would go with the Lay-n-Go Large green. When my granddaughter is hear we lay a blanket down and put all her toys on it anyway, this would keep me from picking them up one by one. My niece’s daughter would love one of these (well, my niece would love it for her daughter 🙂 ). I would get the lay n go lite in green! That’s my sons favorite color!! I have two daughters and they love legos, so any of these would be awesome! It would be especially great for trips to see family when we are holed up in hotel rooms and have to bring an assortment of toys. I would get the Large Green. Love it! Perfect for my grand babies toys! My daughter would love the small on in pink – perfect for her baby dolls and accessories! I think it’s awesome. The way my oldest son is, he could lay it out on the floor and throw his laundry on top of it instead of directly on the floor!! One of the large ones in a boyish color would be great! I love it! This would be perfect for all those little legos! I’d get the large 5 foot lay n go in blue for my 3 boys! That’s a neat idea!! I want one!! This is awesome and perfect for my girls. I like the Lay-n-Go Lite in pink. Thanks for the chance! What a great product! I would like to try the Lay~N~Go Cosmo. My cosmetic case is out of control! I think this would be great for my 2 boys who love Legos! I love how versatile these seem to be. The orange and blue would work perfectly for my daughter as she isn’t girly and her favorite color is orange! My first grandbaby will here soon and this would be an owesome thing to have! I would choose the Lay-n-Go Lite Green. i WOULD LOVE TO WIN ANY OF THESE, i LOVE THIS IDEA… SO GLAD i SAW THIS TODAY! I think it’s awesome, save so much time on clean up. Any color would be good, but I have three boys so maybe blue or green. This looks like a great product would be great to use for my sons legos or cars, would make picking up so much easier and fun. I think this product looks pretty amazing…so much easier than lugging tubs of things around… and much easier to store! What a cool item! I like the gold one. My daughter has tons of small toys, this would be great! I love it. Lay N go Lite in Green. Lay n go large in green for all his toy cars! It sounds amazing & useful for so many things. Would love one for my 3 yr old grandson! I LOVE the large green. I’m about to have kiddo number 4 and could see this coming in VERY handy! Love that everything ends up in one spot and not a bunch of loose items falling out of the diaper bag. I like this, how simple and easy. I would love to have this for my beading prodjects. What a great idea!!! This would be handy for my grandson!! Lay-n-Go LITE Red is what color I would choice. These are the neetest things I have seen in a long time. Would love one. Would def like to try a pink one for my daughter!! Easy travel bag for her! I like the Lay n Go in Blue, thanks! I would love this product for my three year old. We are always at a ball field with 2 girls playing fastpitch softball, and a lot of those times are tournaments. I would love something that is quick and fast to lay out and pick up, and also give my daughter room to play without having to drag along a blanket to mangle around with as well. I would also consider these for my nephews Birthdays coming up soon too! I love the ocean blue one!